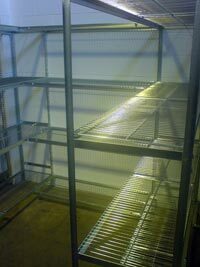 Coolroom Shelving is constructed from solid steel frames, beams and wire shelves. The steel is Zinc Plated to provide both an attractive and hygienic product ideal for storing food product. It has been designed for easy assembly that requires no special tools. The shelves are completely adjustable and individual components can be easily replaced should the need arise. Special Corner Units, Bridge Units and L-Shaped Units utilise the full capacity of the available space in the coolroom so that there is no wasted space.